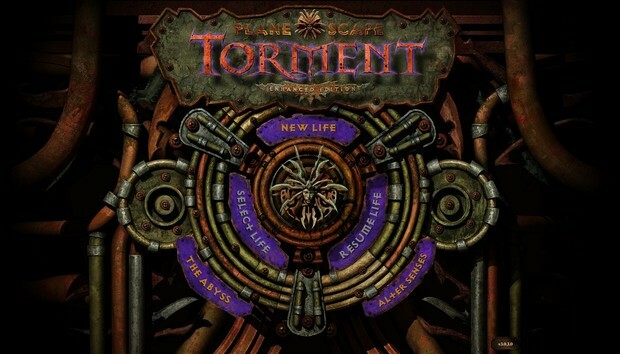 Planescape: Torment is one of the best Infinity Engine games and, by consensus, one of the best RPGs ever made. It’s a game/philosophical treatise/bizarre meditation on life and death that deserves to be played at least once by everyone. Here was the result of all those mods. Playable, though the UI looked a bit rough. The point is it was a pain. Not impossible, nor do I wish to discredit the work done by these modders. They kept Planescape alive, almost 20 years after its release. But a stack of five (or more) mods was a definite barrier when introducing the game to newcomers. That in mind, Planescape: Torment Enhanced Edition is a blessing. I’ve lauded plenty of praise on Beamdog’s Infinity Engine revivals in the past—Baldur’s Gate and its sequel plus Icewind Dale are all excellent restorations. Planescape is no different in that respect. It’s a museum piece, a working version of Planescape with most of the mods essentially baked in. Widescreen? Flawless. User interface? Completely overhauled, ditching the weird circle-interface of the original Planescape and bringing it more in line with Baldur’s Gate. You can hold Tab to see interactive objects, you can turn on “Max HP” in the settings and avoid AD&D’s awful dice-roll quirks, you can activate cloud saves through Steam, you can zoom in and out with the mouse wheel (though be careful not to go too far in), looting can be done automatically to spare yourself the hassle, and the text actually fits on screen and looks properly sized—something I never quite managed even with Ghostdog’s UI mod. The game looks good. More important, it looks polished in a way the mods didn’t accomplish. Mods made Planescape playable, but the Enhanced Edition looks like a game built for modern PCs. There’s a difference, I promise. Is it perfect? No. Some of the more interesting content-centric mods have not made it in, like the Banter Accelerator, which speeds up how often companions talk to each other, and the aforementioned Unfinished Business pack, which as I said repaired some of the quests that were left dangling in the original version. I’ll make those sacrifices though for a version of Planescape that doesn’t need an hour of prep time, and hopefully we’ll see those mods ported over to the Enhanced Edition at some point in the future. Planescape deserves to be played, even today. It’s still one of the weirdest RPGs ever made, testament to the fact that video games don’t need to exist within the tiny box of mass-marketability. There’s an audience for the strange and macabre, for games that are fiercely personal and meditative and thought-provoking. Games that are creative. Planescape’s not the only game to accomplish this, but it does it with a grace and charm most others lack. Seriously though: Don't zoom too far in. 1999 has not aged well. I don’t have much more to add. You’ve undoubtedly heard people talk about Planescape for years. If you haven’t played it? This is the way to go, for sheer simplicity’s sake. And if you have played it, well, a replay can’t hurt. It's that good. You'll find it on Steam and GOG. There's bound to be people frustrated Planescape's price went up from $10 to $20 in the process of being Enhanced, but these games tend to go on sale fairly often. I'd expect to see that price drop during the summer sale season, at the very least. Will AWS & Azure in the UK accelerate adoption and prevent Brexit woes?